Need to beat the heat with a quick and easy snack? 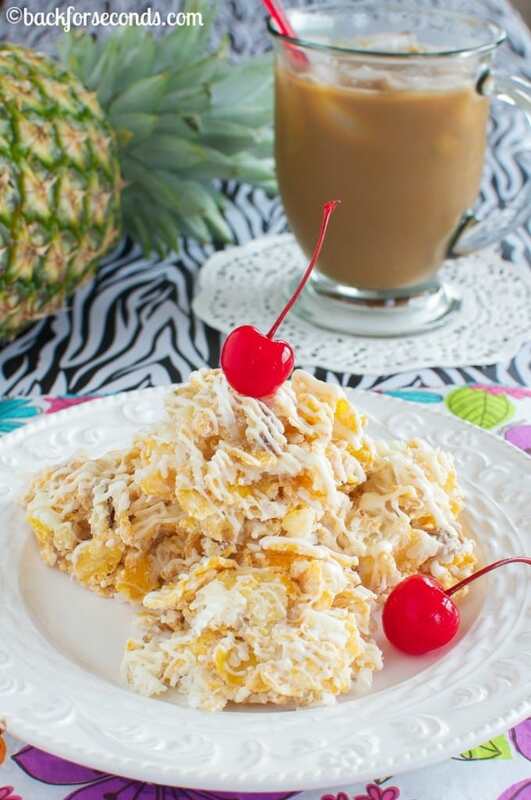 No-Bake Pineapple Coconut Cookies and Vanilla Iced Café, to the rescue! No brewing, no baking, and ready to enjoy in just a few minutes! When the summer heat is in full swing, I want my coffee iced! And you can’t have coffee without a little something sweet on the side, am I right? These No-Bake Pineapple Coconut Cookies come together in minutes and don’t even require an oven – hooray! A few months ago I discovered Folgers® Iced Café. It is probably the easiest, most convenient way to enjoy iced coffee. All you need is some cold milk, then add a bit of your favorite flavored Iced Café. That’s it!! I like to add lots of ice to mine as well, but that’s up to you. Today I used the Vanilla Latte flavor because it best complimented my little snack, but there are 3 other flavors, and they are all delish: Hazelnut Latte, Original Late, and Caramel Macchiato! Which would you choose? How sweet would it be to show up at a friends house with some Folgers® Iced Café, and these No-Bake Pineapple Coconut Cookies? Or invite some friends over for a little afternoon pick-me-up? These are both so simple to make, and everyone is going to love them! The cookies taste like a tropical vacation. Pineapple, coconut, and rum extract mixed with crunchy cereal and walnuts, all drenched in white chocolate. I like to top mine with a cherry to complete the pina colada vibe. What are you waiting for? 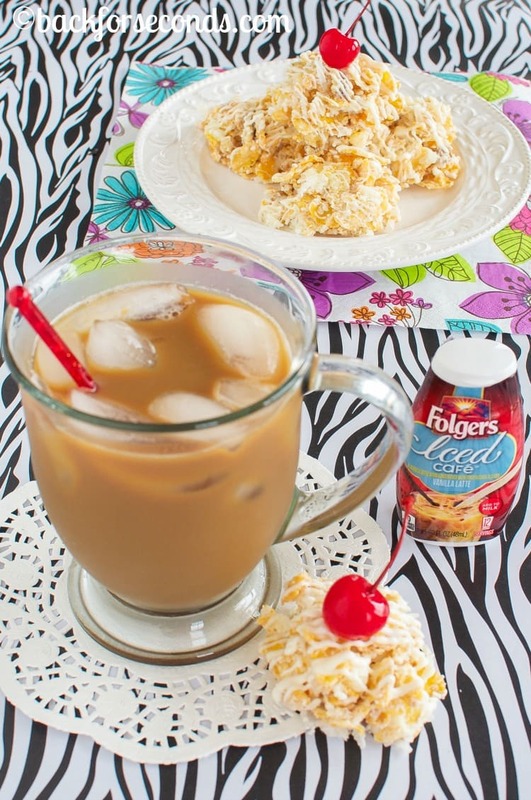 Grab a cup of Folgers® Iced Café and a few No-Bake Pineapple Coconut Cookies, and kick back for a few minutes. Enjoy! Connect with Folgers® on Facebook and Twitter! Pineapple + coconut is one of my favorite flavor combinations! I love the no bake cookies, great for super hot days when I don’t want to turn the oven on. These cookies look amazing! My husband loves pina colada anything. And they are no bake which is a huge win for me with this hot summer we’ve been having! I love that these are no bake! I would definitely like an iced coffee to go with them! 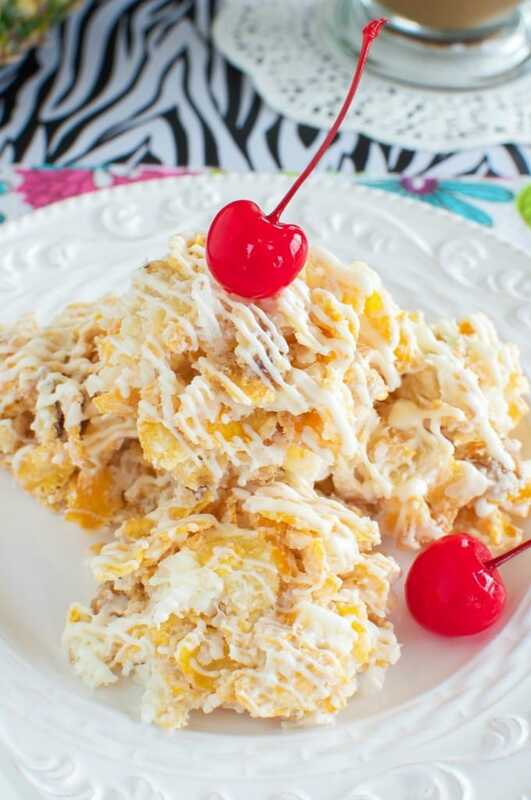 My 100 degree kitchen is thanking you right now for this no-bake recipe! I am dying for a tropical vacation and these cookies are totally feeding that wish! I’m a huge fan of iced coffee and drink it all the time in the summer. I’ll have to check out Folgers brand! These cookies look and sound delicious and so perfect with my coffee. No-bake ANYTHING is my go-to during the summer and I’m sure my pina-colada loving boyfriend would go nuts over these cookies! I’m always looking for new ways to enjoy iced coffee since it’s the only way I drink my coffee so I definitely need to try that out. Iced cooffe and no-bake cookies? You don’t have to twist my arm!